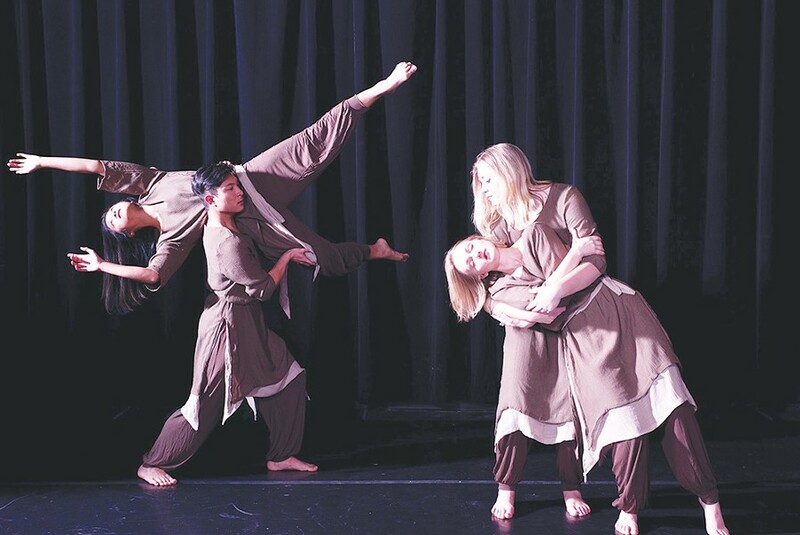 An impressive variety of 11 choreographed pieces with 50 dancers compose Luminescence, the Humboldt State University Dance Program's spring concert. The production is the culmination of original student and staff work, crafting choreographies, costuming, staging and lighting. Modern, jazz, hip-hop, contemporary and other dance styles are included in the many interpretations performed. Luminescence is a recital, so the audience should forgive the overlong pauses between acts. The breaks are deliberate, allowing the audience to familiarize themselves with the programmed intent of the choreographers. And the performances are worth the wait. The flow of the opening night performance was well constructed, balancing higher energy sets with slower, more contemplative ones. Luminescence starts off with a piece for seven dancers, Redemption, choreographed and costumed by Edgar Ocelotl. The choreography is a strong combination of multi-layered placement and motion. Spot-on music and lighting made this a great choice with which to start the evening. The work Reveries of Youth, choreographed and costumed by Austin Silavong, gave soloist Lisa Drew the opportunity to display her power and interpretive flexibility. The choreography was challenging, adding miming moves that painted a picture of childhood. However, when joined with the rest of the piece, they felt mismatched, causing an interruption within the entire choreographic flow. Jessie Rawson's choreography Jet Set was pure fun. It harkens back to 1960s musical theater with dancers costumed as flight attendants. At all times, the dancers were clearly having a ball and their energy was projected into the house. Associate professor of dance Sharon Butcher choreographed Give Me Your Tired, Your Poor..., a dramatic piece with eight dancers, costumed in earth-tones, expressing anguish and struggle. It carried tremendous emotional weight and showed some of the best acting of the evening. This piece was also presented at the American College Dance Conference in March of this year. The final choreography, Blue Print, performed by the Demolishion Dancers, capped off the evening with fast-paced, high-energy choreography. The precision of these dancers was both impressive and enjoyable. Luminescence shows skilled dancing, exceptional acting and stage presence with successful transitions of mood and energy. The HSU Department of Theater, Film and Dance has achieved notable success with this production — catch it while you can. Performances of Luminescence continue at the Van Duzer Theatre from Thursday, April 13 through Friday, April 15 at 7:30 p.m., with a Sunday, April 16 show at 2 p.m. Tickets are available at the door and the University Ticket Office. Call 826-3928.